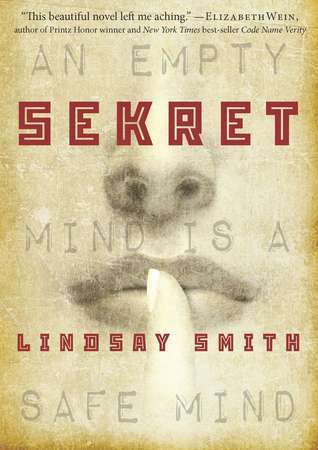 About: Yulia knows she must hide her thoughts and control her emotions to survive in Communist Russia. But if she sometimes manipulates the black market traders by reading their thoughts when she touches their skin, so what? Anything to help her survive. Hanaa S’s (Murphy MS) Thoughts: Sekret is a dystopian… more or less. It takes place just after the Cold War, and the only difference between our world and theirs is they have people with psychic abilities. Some people can see glimpses of the future, others can see into a distant location, and even more of these special people can erase and alter memories. The KGB is a special group that is using teen aged psychics like Yulia to stop American spies from their current mission: finding out the secrets to Veter 1, the soon to be the first object to reach the moon. Yulia has been kidnapped by the KGB and practically forced into the group, with her family as her only reason staying. While in headquarters, she discovers that a lot of her teammates have secrets of their own, Russia isn’t the only one with psychics, and the bad guys might be closer than they seem. It’s pretty cool how the thoughts of the Russians are captured in this story, because I have never seen Russia’s point of view on World War II, the Cold War, or the Space Race. In fact, I didn’t know how they viewed anything until coming across this book. Also, music in this book is used to block out others from reading their minds, to send secret messages, to track people, etc. It’s amazing how Lindsay Smith manages to describe how music is used among psychics, and how the mind and it’s thoughts are like. The details are so detailed it seems like Smith herself is a psychic. The plot twists for this book leave you stunned, and that – along with the fact that the main character thinks their the only one with a special ability, until they have been found out by others, then they realize the enemy also has these powers and the enemies aren’t exactly enemies – reminds me so much of Mark of the Thief. This novel is a bit more mature than Mark of the Thief, but otherwise it deserves to be a Lone Star book as much as Mark of the Thief. If you liked Mark of the Thief but wished there was some romance, then you will be thrilled with Sekret. (PS: Skandal is the second book in this series. That’s right, it’s a series, so people who like series shall enjoy Sekret. This entry was posted in action packed, dystopian, historical fiction, Murphy Middle School, TX Lone Star List 2016 Nominee and tagged Lindsay Smith, Murphy Middle School, Sekret, TX Lone Star List 2016 Nominee. Bookmark the permalink.